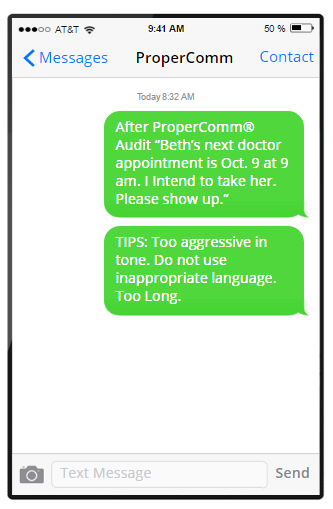 In an effort to facilitate appropriate communication between co-parents, ProperComm® developed a web based email and text message editing company. 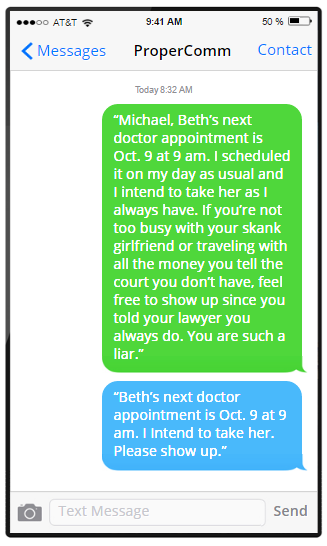 We edit text messages and emails between co-parents who are required to communicate but unable to do so appropriately. registration and payment is complete. to the other party; except as otherwise stated below. as stated in the Refund Policy Statement. credited with one “good” email to go towards the certification. forwarded in its entirety to the intended recipient. No use of abbreviations, e.g. “bff” “syl” “lol” “gfy” etc. word count associated with the “chain” email. appropriate pronouns e.g. I, you, me, my, your, etc. Write your email as if you are writing it to a business associate. must be mailed or delivered through other means. Do not attach links – any links will be deleted. Emails must be about the children or financial issues only. Emails will not be edited for grammar, punctuation or spelling. 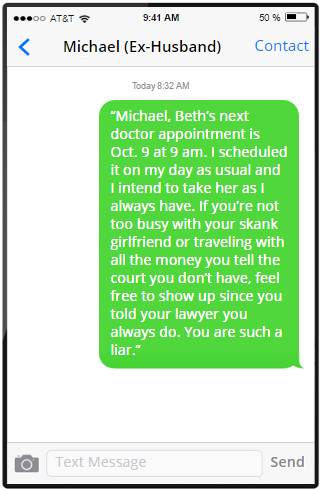 Once a ProperComm® user has received 3 consecutive months of non-edited (good) emails and at least 20 consecutive emails during that time, or 40 non-edited (good) text messages, the user will receive a certificate which they can turn into to the Court to show they have been appropriately emailing the other party. 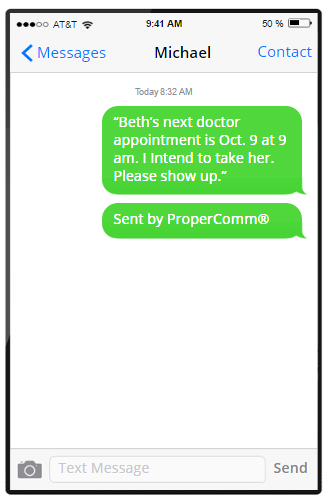 ProperComm® is not liable for any delay in delivery of the email. You agree to add the ProperComm® email address to your email account to avoid the email going to spam. The registering party agrees that they have ready each and every rule above and has agreed to each and every rule stated above.